Alony´s music is a world of atmosphere and secret, spinning around along the edges of jazz, swelling with string quartet and organ sounds, touched by rock and electronic influences. “Dismantling Dreams” is a further proof of an uninhibited, bewildering talent. 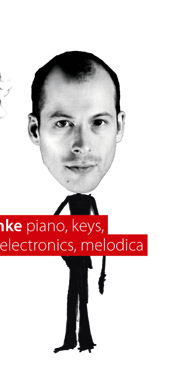 Born in Düsseldorf in 1976, Mark Reinke studied Jazz piano in Arnheim, Netherlands, at the “Hanns Eisler” college of music in Berlin and at Berklee college of Music, Boston with Rob van den Broek, Aki Takase, Steve Gray and Richie Beirach. 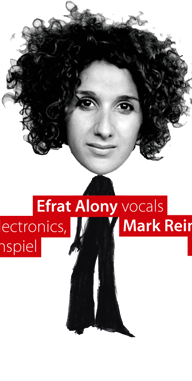 Aside of being the co-leader of Alony he has worked amongst others with Katja Riemann, Sonja Kandels, Hermano Lobo, Tilman Ehrhorn and Johannes Haage. He has participated in various theatre productions as a pianist and musical director, such as the play “saints and singing”, directed by the famous American director Robert Wilson, that toured all over Europe. He also works as a sound designer for the music software company Ableton. Mark has been influenced by very different musical styles, such as Jazz, minimal music, African music or alternative Rock and musicians such as Django Bates, Steve Reich, Radiohead or June Tabor. Mark Reinke uses Nord keyboards and Ableton Live. 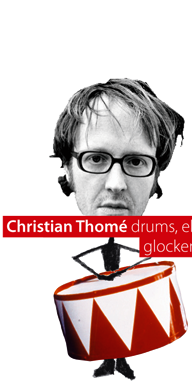 Christian Thomé began playing drums at age 14, he had been studying the clarinet and piano from up age 6. Born in 1970, he grew up in Düsseldorf, Germany, playing music ranging from pop, rock and fusion to swing. In 1991 he went to Arnhem, The Netherlands, to attend the Arnhem Institut for the Arts, where he studied with Joop van Erven and René Creemers. During this time he let his own bands and consolidated his skills in composing and arranging. In 1997 he moved to Cologne, Germany, and has since become one of the most in demand drummers in germany's jazz/new music scene today. In addition to co-leading and composing for the groups Lühning and Arnie Bolden, Christian records and tours extensively with diverse groups including Sebastian Gramss' Mad Michel, Efrat Alony, Trio Stockhausen/Comisso/Thomé, Thomas Heberer Trio, Nanoschlaf, Jürgen Friedrich's bits and pieces and the worldmusic band "Schäl Sick Brass Band". Christian is currently recording with his electronic trio Radio Köber, his latest cd "hauptstrom" and debut album as a leader with his septet Tomatic 7 is available on JHM Recordings. He also performed with musicians, including Lee Konitz, Peter Kowald, Evan Parker, Michael Moore, Dhafer Youssef, Michel Godard, Rainer Winterschladen, Ike Willis, John Goldsby, Markus Stockhausen, Claudio Puntin, Guillaume Orti, Till Brönner, Dieter Manderscheid, Frank Chastenier, Hans Lüdemann, Henning Sieverts, Achim Kaufmann, Sebastian Hess, Hartmut Kracht, Céline Rudolph, Michiel Braam, Wilbert de Joode, Jorrit Dijkstra, Oene van Geel, Peter Fessler, Moritz Eggert, Sebastian Gramss, Nils Wogram, Matthias Schubert, Rudi Mahall.